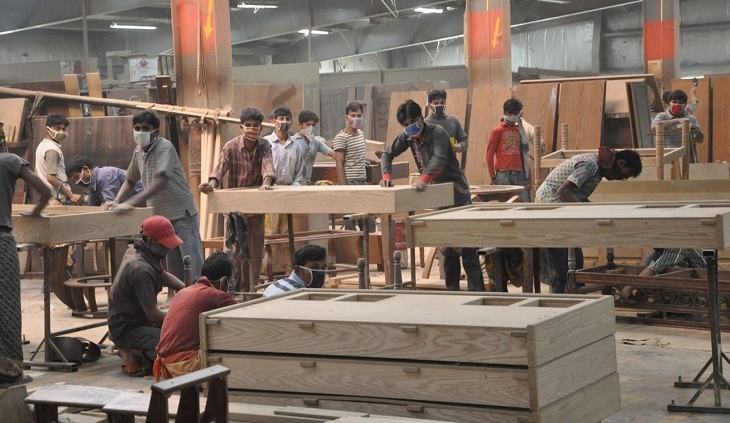 Workers passing busy hours at a factory of Hatil. Photo: Collected from internet. Furniture export from the country has been experiencing a positive trends over the last ten years. In continuation of that trend, the sector has exceeded the export target set by the Export Promotion Bureau (EPB) in the last fiscal. In fiscal year 2017-18 (FY18), the country exported furniture products worth $6.31 crore, up 20.27 percent from the fiscal 2016-17 (FY17). Furniture items worth $5.25 crore were exported in FY17. According to EPB, the country targeted to export furniture products worth $6.10 crore in FY18. That means, the real figure surpassed the export target by $21 lac. Quoting president of Bangladesh Furniture Exporters’ Association (BFEA) K M Akhtaruzzaman BSS said, the furniture industry has been able to consolidate its position in the domestic market over the last ten years. The manufacturers are producing quality products with innovative designs, quality wood and technical skills.